Hill's Prescription Diet i/d Canine is a complete balanced nutrition for growing puppies as well as adult dogs. It is recommended for gastrointestinal disorders - gastritis, enteritis, colitis, most causes of diarrhoea, malabsorption and bacterial overgrowth. 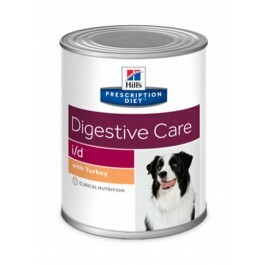 In fact, i/d is clinically proven nutrition to settle digestive upset in as little as 3 days. This food aids recovery from gastrointestinal surgery and minor surgical procedures, and is also recommended for exocrine pancreatic insufficiency, acute pancreatitis and bloat. 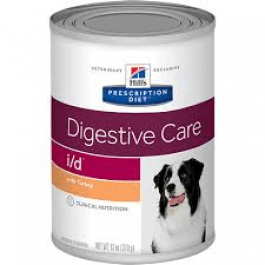 Hill's Prescription Diet i/d Canine should be recommended by your veterinary surgeon. For detailed information on feeding amounts and how this food can help your pet, please consult your veterinary surgeon. Exclusively feed the recommended Prescription Diet food and keep fresh water available at all times. Please note that this is a guide only and that individual animals may have different requirements. Adjust the feeding amount to maintain the optimal body weight and divide into 3-6 meals per day. Based on a puppy's age and weight, feed the same number of large cans, or grams of dry food, as shown for Puppy Healthy Development in the Daily Feeding Amounts for puppies plus an additional third (33%) for i/d Canine canned or an additional 10% for i/d Canine dry.